New Berlin high school pop up with Lubar.After the semester long course, the high school students put together a portfolio of what they learned about entrepreneurship. And then, if they enroll at UWM, a faculty member will review their portfolio for academic credit for the work. The kids were juniors and seniors. The high school students started class by discussing their company’s business model. Called Cozy Up, the business they were planning would sell blankets. Their task for the day was to develop the company’s brand. Cozy Up was designed around a “one for one” business model — for every blanket sold, a blanket would also donated to a child in a hospital. 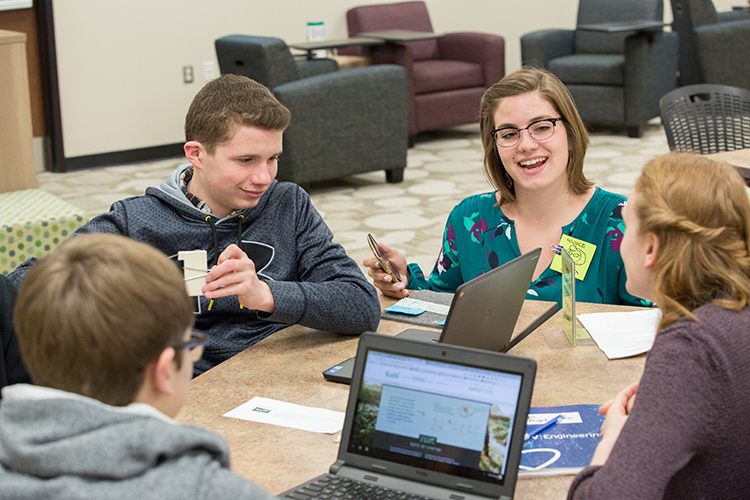 Miller, who will be a sophomore in UW-Milwaukee’s Lubar School of Business in the fall, was among a group of juniors and seniors at New Berlin’s Eisenhower and West high schools who learned to think like entrepreneurs through their school district’s Advanced Innovation & Design course. First taught in 2017, the class is co-facilitated by the Lubar Entrepreneurship Center. Upon successful competition of the course, students like Miller can apply for three UWM credits. The School District of New Berlin pairs the students with entrepreneurial mentors from the community. The district also supplements instruction by working with UWM’s Lubar Entrepreneurship Center and the Commons, a Milwaukee-based an entrepreneurial skills accelerator for college students in southeast Wisconsin. 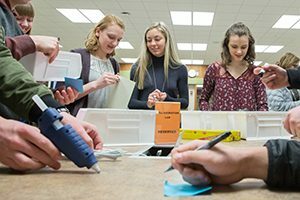 “In helping create this course, we took a lot of what we’re doing here at UWM and helped New Berlin incorporate it into a high school course,” said Brian Thompson, director of the Lubar Entrepreneurship Center. The center has also collaborated on programming with the Shorewood School District and Pathways High in Milwaukee. The course also provided students with a glimpse of the future. In addition to Miller’s work on the “one for one” blanket company, other groups have designed businesses that would provide clean water to cities in the U.S., outfit buildings with energy-saving solar panels, provide affordable school supplies to families and develop educational software. “This replicates the workplace because the students are working with the same people every day and understand their strengths and weaknesses,” said Shawn Upton, one of the class’s two instructors. A UWM alum, Upton worked in marketing before becoming a teacher at Eisenhower Middle/High School. Several times each semester, the Lubar Entrepreneurship Center sends faculty, staff and students to conduct “pop-up” classes at the schools. A pop-up is an interactive class that helps the students develop entrepreneurial skills such as customer discovery and pitching to investors. 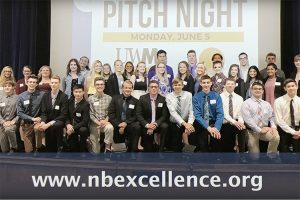 At the end of each school year, the school district hosts a pitch night where students present the work they accomplished over the course of the semester in the same way they would pitch to real-world, prospective investors. For Miller, the class helped her to pursue her career before she’d even left high school. Read the original article from the UWM Report here.